The nanny job description clearly lists the common key duties, activities and responsibilities associated with a nanny position. Nanny duties will vary from nanny placement to nanny placement and household to household but almost all nanny jobs will involve an element of these typical nanny and child care tasks. Select the information that applies to the job you are specifying and create a practical job description for your nanny position. Provide complete care for the children in the employer's home and perform all tasks that correlate to the care of the children. To create a safe, nurturing and stimulating environment in which the children can thrive and develop. A nanny job may include housework duties. In addition to the above nanny duties, a live-in nanny may be required to attend to the children if they wake at night. A nanny who is hired to care for a newborn baby may be responsible for bottle feeding and settling the baby through the night. Use this nanny resume to create a job-winning resume. Send a winning nanny cover letter with your job application. Prepare for nanny interview questions using these interview answer guidelines. This job description is a useful resource for both applicants for a nanny job and prospective employers to clarify what is expected in nanny placements. 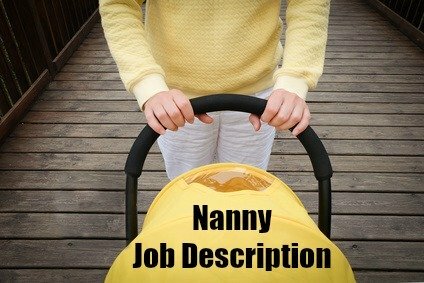 Indeed.com reports that the average salary for nanny postings in the United States on the site is $14.62 per hour as of April 2019.